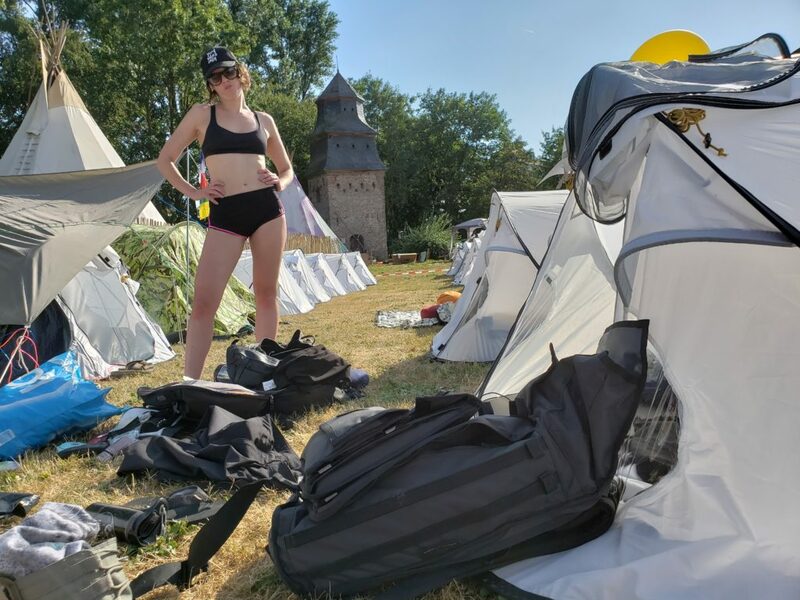 My Radian travel pack joins me on a maniac trip across Europe raging through The Gardens of Babylon Festival, Amsterdam, Berlin and hacking our way into the Garbicz festival in Poland, where it was run over by a car–and my laptop survived! Some people have a gambling problem, others Bon Bons, mine is bags. I love bags. I’d been hearing about The Radian long before it was available. So let’s just say my expectations were high. 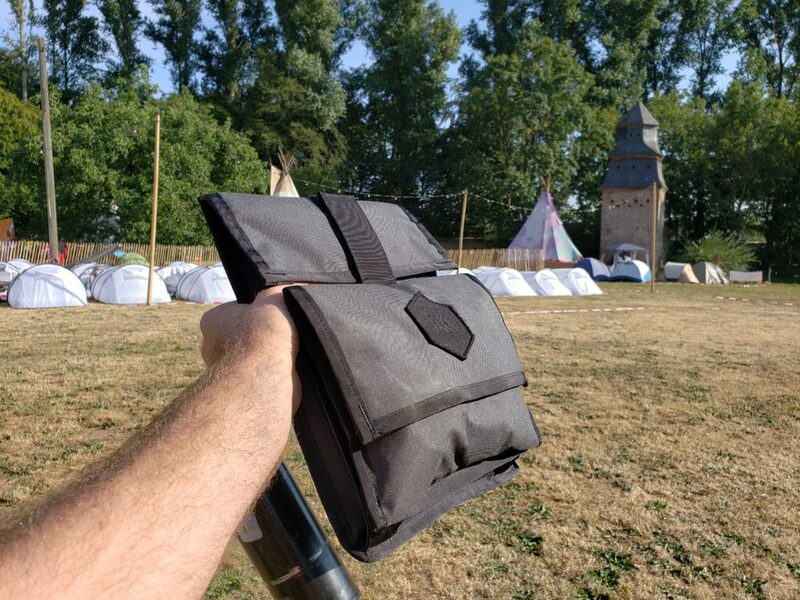 Amsterdam, Paris, Berlin and two festivals packed into 10 days, seemed like the perfect opportunity to test the new Mission Workshop Radian travel bag. And trust it was. Packing, the first major test of any bag. My favorite travel bag back in the ‘90’s was this old orange North Face bag I borrowed from my dad. It was a real backpack, but not bulky. 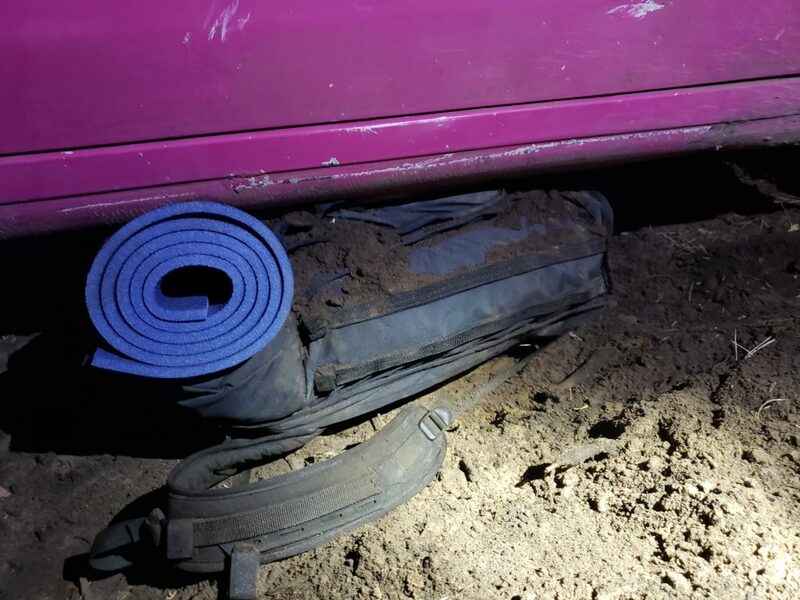 It kept a fairly low profile to the body, unlike your typical backpacking pack. My favorite thing about this bag is that it clamshelled open instead of having to be top loaded. My first experience packing The Radian brought back all the fondness of this bag as I flip the entire front of the bag open, exposing the entire bag and ready to pack. It even has a netted pocket built into the length of the flap, to create some isolation. My packing style has drifted towards separating items into small bags, and then packing those bags into the main bag. It’s a sort of modular system to make packing and organization on the road easier. Pro Tip: Next time you’re leaving a plane and you walk through business class you’ll see the little bags they hand out with all the extras. There’s almost always a couple left behind, and trust me their next stop is the garbage, so grab those puppies and get organized. My friends that travel with me marvel at how little space my clothing takes up. I have 3 secrets. Don’t bring too much clothing, and what you do bring, better count! I really bring the bare minimum. Some people on trips kick themselves for what they didn’t bring. I kick myself for bringing anything I don’t use. I’d much rather need something and not have it, then have brought too much. OK, this years summer trip to Sardinia, I broke down and bought a white linen shirt, shorts, and loafers. That’s right, you can always buy something there, and it’ll be very appropriate for where and when you’re there. Dress like a rockstar, or a DJ. In other words, wear black (and combat boots).Once I figured out that most people in the fashion industry wore all black, I started doing it. It really works everywhere. On stage at conferences, a black T-Shirt and combat boots has become my hallmark. At the other extreme from a professional technology conference are the electronic music festivals I attend. And at those, it’s quite often people come up to me and thank me for my set. Get a garment folder. Pretty much anyone that travels with me the first thing they buy when they get back (or order from the road) is garment folder. My parents gave me an Eagle Creek Pack-It 5 years ago and it changed my life. Not only does my clothing get compressed down, but it’s perfectly organized and shows up in better shape than I put it in there, seriously. So you can only imagine my delight when my garment folder fit perfect in the clamshell opening of The Radiant. It’s kind of like that moment when you’re introduced to someone, and there’s a little twinkle in their eyes. Well, I knew then that this bag and I were going to hit it off. And once the bag is organized, not just packed, the clamshell can just be zipped shut. 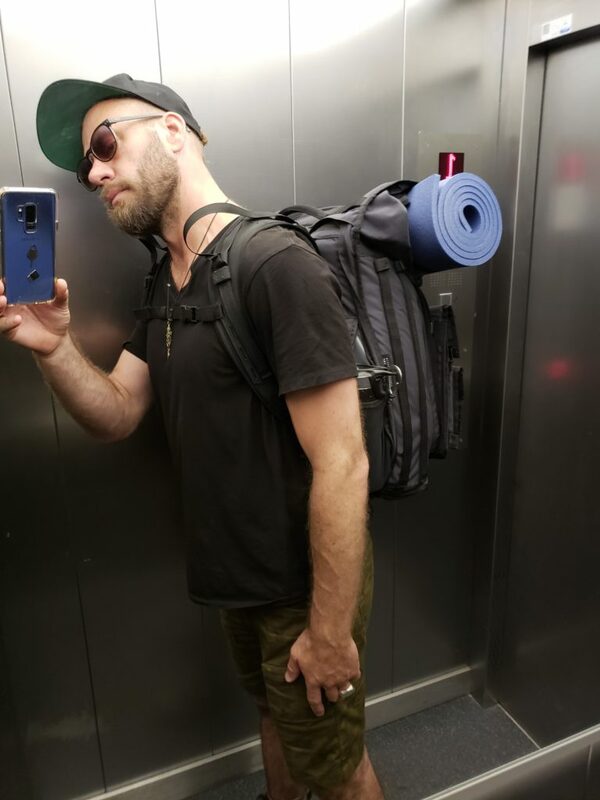 Unlike my vintage orange North Face bag, The Radiant can still be top loaded, which is nice for throwing in that last minute thing I always forget to pack. Just like leaving the house for a road trip, there is always something I forget, or at least I feel you did. I actually figured out a solution to this, just intentionally forget something unimportant! That way it doesn’t nag you, because you know what you forgot. Whether I forgot something, or I just want to have something readily accessible–like a jacket–the top loading is nice because I can open it and take something out without having to open up the whole bag. With the bag closed, it’s super sleek and compact. I like it! But all I have packed so far is the stuff I flop out in the hotel room. With as much time as I spend in transit, I need to be able to do pretty much any of my work. And for me, this varies from trip to trip. Sometimes I’m filming, sometimes with audio, sometimes with just my phone. Other times I might have my drone or my 360 camera gear. What I’m really getting at is that the core living items stay pretty much the same, and get locked into the main part of the bag. 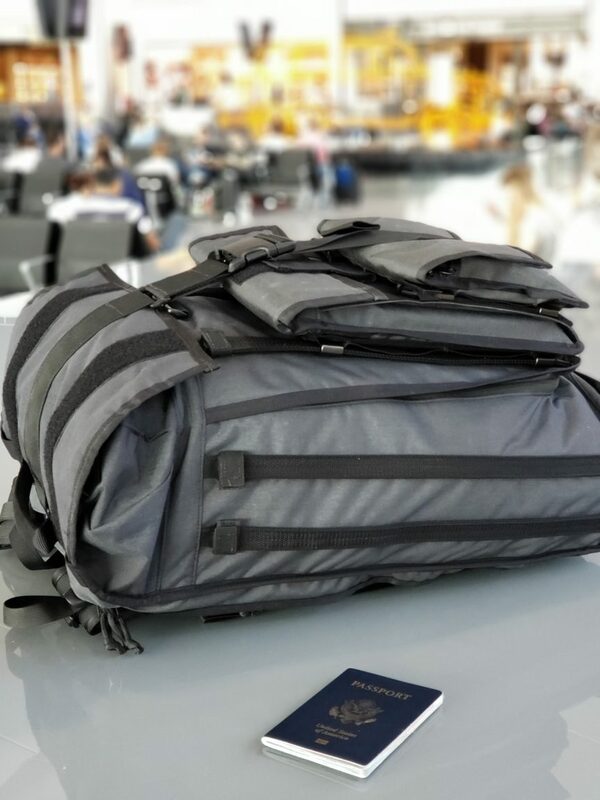 My tools of the trade vary heavily from trip to trip and often need to be accessible while traveling. Enter the Mission Workshop Archive system. I first ran into this when they had patented a fastening system on their Fitzroy Bag. I bought this bag when it first came out, even though it was way more than I could afford at the time (remember I have a bag problem). The way it works is the metal fastener acts like a hand grabbing a piece of webbing. The metal slides up and down the webbing, but doesn’t pop off. It’s an ingenious use of a textile to create a lightweight mechanical fastening system. The Archive System takes advantage of this invention by placing webbing rails on the main bag, and then accessory bags with metal clips that can just be slide on and off. In practical terms, this means that I can have a whole assortment of bags (camera gear, drone, 360 cameras) that just slide onto the main bag when I need them. Look, when I’m at home 14-hours between trips sometimes, I don’t want to spend it packing–I want to sleep! The core stuff gets washed and put right back, and then I can swap out gear. In the case of this trip, I’m traveling ultralight and using gear that will let me be right in the middle of the action–full insurgent. I’ll be filming with my 4K phone and a Gear 360. 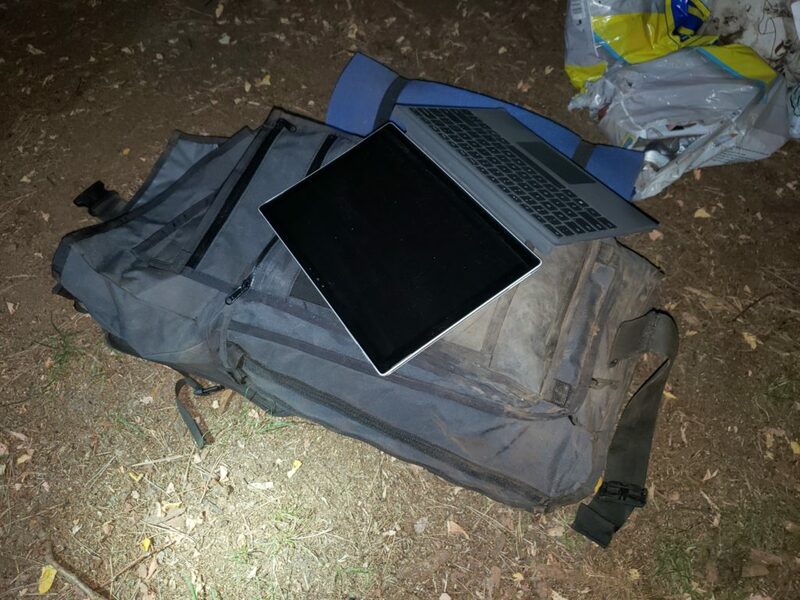 I do need to bring my laptop, which is actually a Microsoft Surface Pro. It’s the best of both worlds, tablet and laptop. With a micro-SD card reader and 1TB SSD, I can manage my media on the road with it. And, it’s super compact and lightweight. I grab an exterior Archive pouch and bam my Surface slips perfectly in, it’s like it was made for it. I throw in a notebook, pen, passport, portable battery, and a water bottle. Wait, where do I put my water bottle? Which is the best coffee, tea, water vessel ever made. It’s a Camelback Forge and I love it. It seals completely but can be opened by one hand while drinking. It keeps water cold, or hot, and can be refilled at any airport in the world. I don’t actually need the water bottle at the moment, so I just throw it in the top and off to the airport. At the airport I pass through security and then immediately pull out and fill my water bottle. It’s got a carabiner on it, so I just clip it to the side of the bag. At the gate, I look down at the water bottle resting next to the bag (some people look over at their travel partner) and wonder why they didn’t put a pocket right there for a water bottle. And then I notice a little zipper, right there. I reach down and unzip it. A little mesh bag pops out right there, perfect for a water bottle. Whoa, thank goodness there are people a lot smarter than me! And then I notice other zippers concealed around the perimeter of the bag. I don’t open them though. I want them to be like Christmas, waiting to open presents to really savor them. That said I go ahead and open one more, the one at the very top of the bag right at the seam near my neck. It’s the perfect pocket for sunglasses, a portable battery and charging cables. Talk about the gif that keeps on giving. Joining me to the airport is my friend Ellie. We’re going to the same festival at a Monastery in Goch, Germany called Gardens of Babylon. Upon meeting up in San Francisco to share a Lyft to the airport I notice she’s sporting a new bag. Bear in mind she’s ex-Israeli Military, so she knows what’s up when it comes to gear. She walks in all proud of her new bag and looks down to the see The Radian and exclaims: “What’s that?” I’m not sure how to describe the look of jealousy, but hers was it. Other than the Lyft from San Francisco to SFO, we’re taking completely different routes, and on the way to the airport we find out both our flights were delayed or oversold. Her flight is delayed, so she’ll miss her connection. As for me, instead of 2 flights to get to Amsterdam and catching a shuttle bus directly to the festival, I am left in a state of limbo not sure exactly how I’ll get there. I decide to hop a flight to New York just so I’m moving in the right direction. The race is on from SFO to Goch, and clearly, due to my bag selection, I already have the advantage. I fly SFO to New York, Kennedy, then get on a flight to London, Heathrow and then catch a discount airline flight to Dusseldorf. The problem with European discount airlines are that they are super strict about carry-on baggage. To me, it’s just a challenge to see what I can get away with. Pro Tip: The trick to getting any oversized carry on bag onboard is for it to not have wheels. This also happens to be one of my 8 Tips for staying healthy and strong on the road. 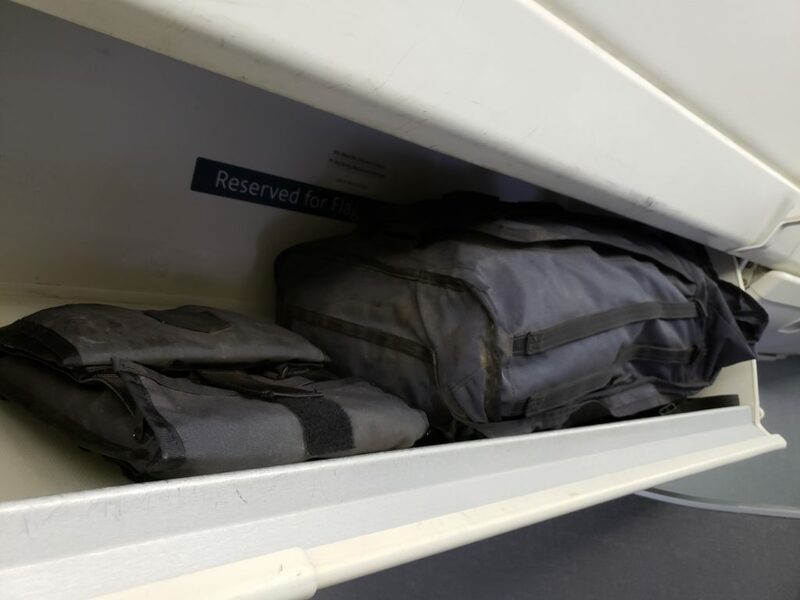 When they’re looking at carry-on size, they’re always just looking down at the roll-aboard bags. It also helps to be 6’3” to make most bags on my back look smaller. Although, everyone once in a while, this will get me into trouble. Like on this flight when I get on the plane and the overhead compartments are tiny! I try to put The Radian in the overhead and there’s no way it’s fitting. People are looking at me, what am I going to do. And then it occurs to me, The Archive system! I release 2 velcro straps and then slide my tablet, notebook and headphone pouch off the bag. It slides right in, and I sit down noticing that I have everything I want for the flight. In Dusseldorf, I catch a train to Goch and then somehow order a taxi over the phone in German. I don’t speak German! The taxi takes me the last 20 minutes to the festival. Despite having an extra flight, and train ride, I still beat Ellie to the festival by 30 minutes. 2 people travel halfway across the planet, by completely different means and arrive within a half hour of each other, it’s pretty cool. By the time she arrives, I figure out where we’re camping and where the lockers are. In Europe, they provide secure lockers to keep valuables in. Apparently, it’s quite lucrative to buy a ticket for a couple hundred bucks to a festival and then when everyone is off their faces at the main act, to go through the tents and grab a few phones (happens everywhere btw). The solution; lockers. To me it’s more like a bear canister. If everyone uses a bear canister then the bears learn there is no point in going to camps food, because it’ll be locked up in one of those bear-proof canisters. Same with the lockers, it keeps lame people from coming to festivals. While Ellie is trying to find everything she wants to put in the locker, I simply slid off my Archive pouch with all my valuables and am ready to drop it in the locker. Viken Arman – I love his music and this set was completely over the top. KMLN – If you haven’t seen them, do. The live show is incredible, especially if you want to be in a group of people completely letting go and dancing! Blond:ish – They are just rock solid, always delivering just the right set for the occasion. Post-festival we hop a bus to Amsterdam and sleep for a day. My buddy Carlos is also in Amsterdam and convinces me to come to Berlin. We hop the train and on the train, we start talking about this other festival happening the next weekend called Garbicz. I’ve been hearing about this festival for years, but never managed to make it there. Real life can wait, I want to hit it. But first, I need to kill off this cold. I ring up my buddy Ben in Berlin to see if I can crash in his guest room. Sure enough, he’s flying in that night from Ibiza and I can bed down there. Before I crash, I use one of weapons in my arsenal for killing a cold as it starts on the road. I do some Wim Hof breathing. I told Wim I wouldn’t share his techniques, so you’ll have to check out go to the source yourself. Sure enough, the next morning, well afternoon, I wake up and I’m cured! Off to the next adventure. I’m in Berlin and trying to figure out a way to The Garbicz Festival (yes, pronounced garbage), which is in Poland. There’s a bus that goes there. But the German police know to look for this bus and to search it for drugs. I’m not worried about being searched, I just don’t want to stand around and wait while everyone else gets searched. At the same time, two of my friends are performing at the festival and are looking for a ride. I figure as artists they should be given a shuttle. So I reach out to a friend, who happens to be neighbors with one of the organizers, and yes, they should be on the artist shuttle. A few emails and they’re sorted for a ride on Sunday, exactly when they land after their gig in Zurich the night before. The band is KMLN and they’re crushing it! I figure that’s about when I want to head to the festival, so I decide to show up at the time I told them to. The girl organizing the shuttle asks if I’m an artist. I tell her no, but that I was the one that helped arrange their situation and if there happened to be an extra seat I’d jump in it, if not, I’ll take the train later tonight. 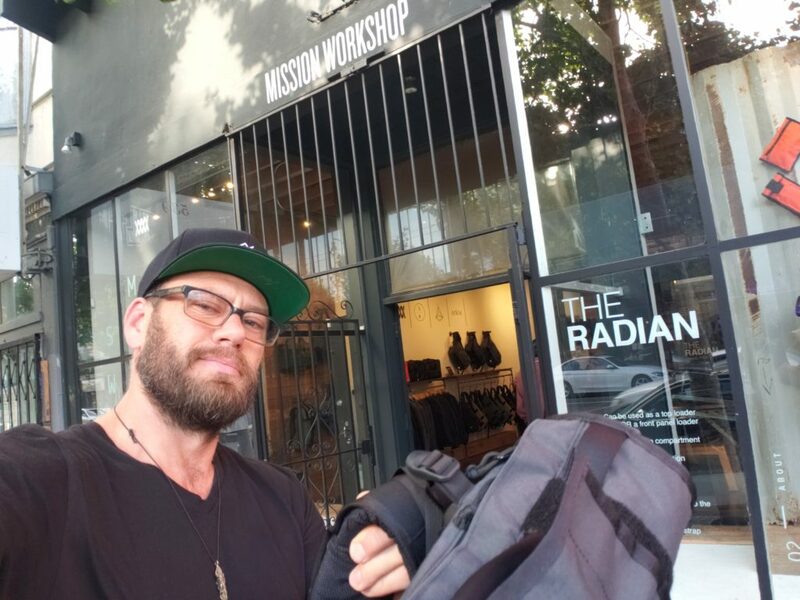 She asks if I have bags, I turn to reveal The Radian on my back and she gives me an appreciative smile and marks something on her clipboard. After everyone has arrived for the shuttle, she approaches me and informs me that we have one too many people. I tell her no problem, and I hope to see her there. She tells me that she thinks I should ro sham bo (which she explains in gesture) with him for the seat. I laugh and tell her I’d be happy to. I’m guessing she told him the same thing, and his reaction wasn’t quite the same. The next things she tells me is I can have the seat and that we should get going. Being considerate I go over to the guy who didn’t get on to let him know the plan for the train, his response. “You go take the f@#&ing train!” I realize then why she didn’t want him on the shuttle. She is so sweet too. She asks if we want to stop anywhere. Chris, Shawna and I, being the professional festival hackers say: a grocery store! Which as it turns out also has a full beer/liquor store attached. While I am the last one out, it’s not by much, and I have 10x what most the other people bought. 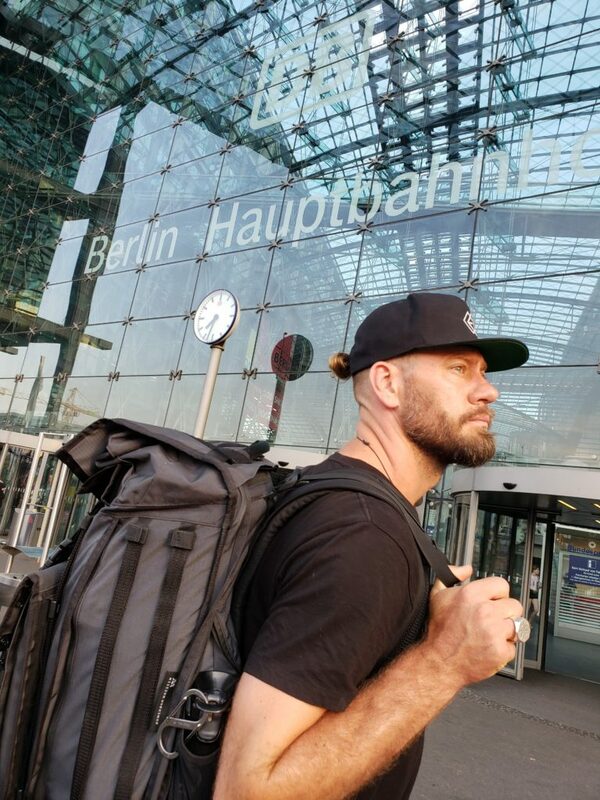 I even got some nice canvas bags that say Berlin on the side to hold it all. Arriving at the festival, all the artists are ushured to artist check-in. I meanwhile don’t have ticket yet, and there’s even a long line for people that have tickets. Hmm, I’m not going to get my credentials before all the artists are checked in and the executive shuttle with all my stuff leaves. Straight to the festival hacking playbook. Go to the person behind the table not helping anyone. Disregard whatever sign may be above them. Create rapport before even hinting at what I need. Make it seem like I need help with a really hard problem, complicate it. Escalate my issue to the head person in charge. Get them to say how to solve the problem, even if it involves using the only scanner, which is the bottleneck for the long line. Hey, the boss said to do it for me. Race to catch the artist shuttle. It almost all goes according to the playbook, except I can’t load the message on my phone giving me the right to buy a ticket. So I have to get Christopher to pull it up on his phone, and then I take a picture with my phone of that, and then have her scan that. At the end of the day, I somehow walked away paying the artist guest rate AND getting a RFID wristband loaded credits for food and booze. Thank goodness for the playbook! The most important thing is that I caught the artist shuttle, which takes us deep into the festival. Here we’re met by friends who take us into production camping, and then deeper, and then up the hill, till where about as far up and away from the main area as one can get. It’s where the houses of the founders of the festival are. It also happens to be where they’ve parked Christopher and Shawna’s rental car with all their camping gear. Like a complete idiot rookie, when I put my bag down, I put it down behind this pink art car looking thing. Well, apparently it moves and they backed right over my bag. Got stuck, drove back forward. Still stuck, and backed up again. To get it out, we literally have to half undig it and have 4 dudes with a log leverage the car up to get it out. A German girl asks, is there anything valuable inside. I look at her and say: “Laptop.” The look on her face in response is priceless. I brush the dirt off the bag, pop open the archive pouch and slide out my Surface 4 Pro and the screen is completely intact! We all have a micro-celebration, and they’re off. But that didn’t stop me from setting up camp on their picnic table right in front of their house, done in all practicality. Not only was my Mission Workshop bag run over, but also my newly purchased canvas bags with Berlin printed on the outside full of my groceries. The canvas bags are destroyed and my bread, jars of herring, Guinness, and other food is in various states of disrepair. I use a nearby picnic table to clean and sort my stuff. 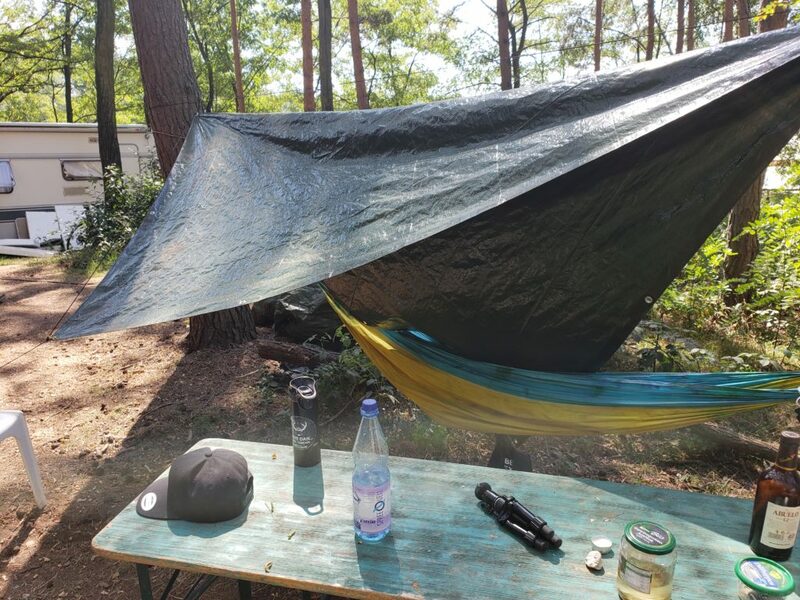 Long story short, I never leave the spot and end up camping there. It’s not until leaving the festival that I realize how bold this was. The picnic table I chose was the deepest spot in production. It’s basically like showing up at burning man and pitching a tent in front of the CEO’s trailer, except there’s no wristband to get in front of her trailer! When I started traveling when I was 16 my dad gave me this orange North Face bag. It worked so well, epically well. But I didn’t know how good it was back then. It was just a bag to me. But since then, no other bag has nailed it like dad’s bag, until The Radian. My dad clearly knew what was up when he gave me that bag, and I hope to do the same when I pass this bag off to my daughter for her first adventure.